As spring 2018 springs, Moon Dog has reached into the vaults and plucked out a couple of past IPAs. 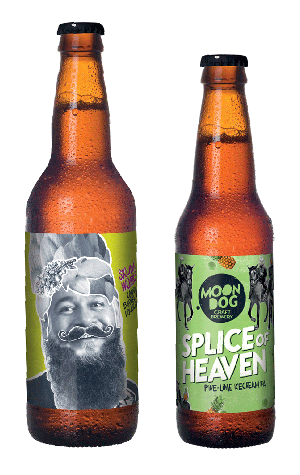 Indeed, with Skunkworks, they've gone right back to the start with the first beer they ever released in bottles, while Splice Of Heaven is a tweaked version of what may have been Australia's first lactose IPA when it first appeared. Skunkworks is a Cognac barrel aged double IPA and was also a statement of intent by the brewery back when it launched with two of the three mates sleeping in the old office space at their original Abbotsford home. Much of the rest of the beer world might be playing around with wanton abandon these days, but this beer was like little else on these shores at the time. Now out in 640ml longnecks, it's a beer in which the time in oak contributes more aroma wise than the hops, with the barrels also adding a tannic quality to the not inconsiderable herbaceous and woody bitterness. It's a big beer with a boozy prickle – 9.1 percent ABV – and that alcohol combines with the hops, malt and Cognac barrels to create some stewed fruit like flavours too. As for Splice Of Heaven, their take on Splice ice cream that debuted at the Good Beer Week Festival Hub in 2015, it returns sans lactose but with vanilla, the latter going to work to create the ice creaminess underpinning and fattening out the IPA's tropical fruitiness.